Perfectly located to explore the hustle and bustle of the historic market town of Alnwick, from Tom’s Cottage in Alnwick you can walk to a great range of restaurants, pubs and shops, and also the Farmer’s Market in the town square to pick up a few local goodies and collapse in front of the relaxing fire for an afternoon snooze. This is the most perfect market town retreat for parking the car and enjoying a break on foot! Tom’s Cottage provides the ideal base for exploring the rest of Northumberland too, as Alnwick as not only a great place to be based but it’s also easy to access the rest of the county whether that be coastal or country, as well as Alnwick Garden, Castle and the famous Treehouse Restaurant and the renowned Barter Books, which are both only 10-15 minutes’ easy walk from the cottage. Sleeping up to 4 guests, Tom’s Cottage is just as perfect for a couple as it is for a small family. Recently renovated, this contemporary terraced cottage includes features like wooden shutters and a huge leather corner sofa, so you can return back to the cottage and relax. 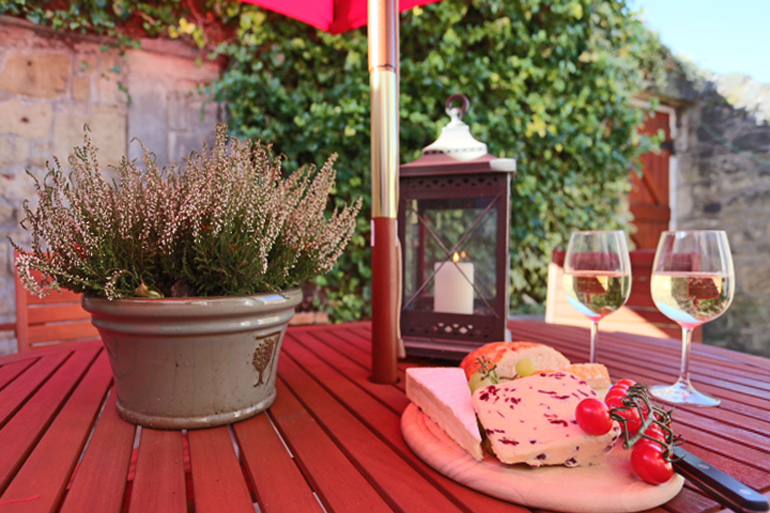 It has a small courtyard too with a table and chairs for enjoying a glass of wine on balmy summer evenings. Tom’s Cottage welcomes 2 dogs and has free Wi-Fi as standard. Tom’s Cottage in Alnwick is a mid-terrace townhouse situated on the outskirts of this historic Ducal town, it’s within easy reach of all the attractions of this lovely town, including Alnwick Castle, the famous Alnwick Garden and Treehouse Restaurant, Barter Books and a great range of shops, cafes and restaurants. With 3 bedrooms accommodating up to 4 guests, with a well behaved dog welcome too, this is a versatile cottage which has just recently been extensively renovated, with a lovely large kitchen, beautiful bathroom, cosy lounge and private courtyard garden – all within walking distance of the amenities of Alnwick. A cosy room with a large corner sofa, ambient lighting, large flat screen TV, dining table and 6 chairs. A fabulous newly fitted kitchen with all the usual appliances including electric oven and hob, fridge/freezer, microwave and washing machine. With a comfortable king size (5ft wide) bed, luxury bed linen and towels. Double-sized bed (4ft 6″ wide), fluffy towels, luxury bed linen and a hair dryer are provided. 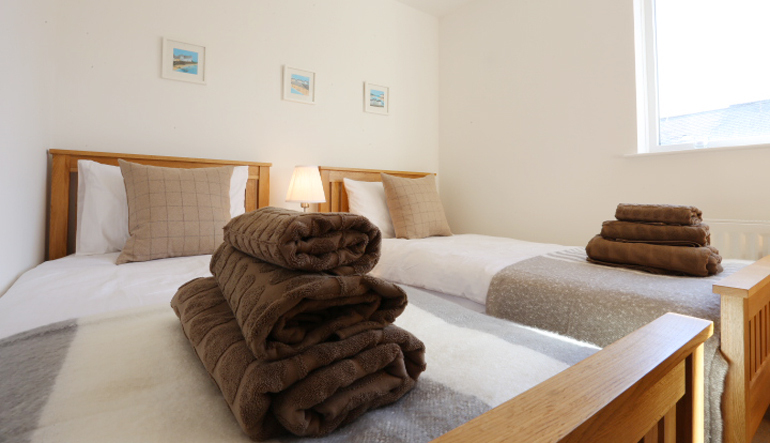 The third bedroom has 2 single beds (3ft size), fluffy towels, plenty of storage and has a hair dryer provided. There is a freestanding bath with shower above. WC and wash hand basin. Towels and complimentary toiletries by the White Company provided. A little sun-trap! Fully enclosed with a decked area, and table and chairs for 6. The courtyard is accessed from the kitchen and has a very Mediterranean feel to it, especially on balmy summer evenings. Parking is available in the street to the front of the cottage but is not allocated or private. It’s usually possible to park right outside the cottage. In the centre of Alnwick, Tom’s Cottage is a quirky and homely townhouse perfect for coming home to after a long day exploring. Soft, squashy leather corner sofa, plush bedrooms and a luxury bathroom make this cottage a luxurious base in Alnwick. The cosy lounge has been completely refurbished and has a large, luxury leather corner sofa around the flame-effect fire. The Smart TV and Nintendo Wii will keep everyone entertained! The light and airy kitchen looks out to the private rear patio and has 4 bar stools around a breakfast area and separate high glass table for extra seating. This spacious bedroom is comfortable and homely with some luxurious touches. The plantation shutters look out to the front of the cottage . The high ceilings and spacious annex's embrace the traditional terrace townhouse feel. The double bedroom with a 4ft 6" wide bed, also looks out to the front of the cottage out of the plantation shutters. The twin bedroom is very light and airy with a large window overlooking the rear yard. The twin beds are full size with plenty of drawer space. The patio is very pleasant, with wooden chairs and table to seat 6 with a lovely big parasol too. The patio is private and intimate - perfect for dining al fresco in the summer! The bathroom is spacious and fully tiled. with a stand-alone bath, large, walk-in shower, wash-hand basin and WC. 3 bedrooms; one king size room (5ft wide bed), one double room (4ft 6″ wide bed) and one twin bedroom with single size beds (3ft wide). Feather duvets are provided on each bed. Hypo-allergenic filled pillows are provided on each bed. The master bedroom (king size bed) and bedroom 2 (double bed) have alternative hypo-allergenic filled duvets. If you require these two bedrooms to have hypo-allergenic duvets, please inform us at the time of booking or a minimum of 7 days before your holiday. Bedroom 3 (twin beds) have feather-filled duvets. 2 bathrooms; one bathroom with a bath, walk-in shower and WC and wash-hand-basin on the first floor. There is a WC on the ground floor. Towels, a hairdryer and luxury White Company toiletries provided. Fridge/freezer, electric oven and hob, dishwasher, microwave, toaster and kettle. Washer/dryer, iron, ironing board and vacuum. Hairdryer, books, music and films. Accommodation on 2 floors; the ground floor has the dining lounge, kitchen and WC. On the first floor there are the three bedrooms and the family bathroom. Welcome Hamper including luxury White Company toiletries and bespoke Property and Area Guide. One baby welcome. Travel cot available upon request but there is no highchair or stair gate available. Two dogs welcome for £20 each per holiday. Booking Conditions apply and see more details on our Dogs page. Dogs are not permitted to be left in the cottage unattended. Dog sitting service available, contact us to enquire and request. TV in the lounge with Freeview, hi-fi, free Wi-Fi. Spacious paved and private patio garden with a table, chairs and parasol. Completely enclosed by approx. 6ft walls and has a secure gate. There is no BBQ provided at Tom’s Cottage. Due to the surroundings and setting, it is not suitable to bring your own. Our ‘Coquet’ cottages are much-loved privately-owned holiday homes into which our owners have lavished much care and investment to create beautiful places for their guests to enjoy. We therefore require a cautionary Good Housekeeping Deposit to protect our owners’ property, so that if damage/breakages or exceptional cleaning is required up to the value of the deposit, the owner can be recompensed. Our virtual tour allows you to ‘virtually’ walk around Tom’s Cottage as if you were there, just click on the arrow to start your journey. A floor plan can be viewed as part of the virtual tour. Tom’s Cottage is located in central Alnwick, making it the perfect spot for exploring the beautiful market town on foot or the rest of Northumberland by car. The centre of Alnwick can be reached in just 5 minutes on foot making Tom’s Cottage really central for exploring the town and also for the rest of the area. Alnwick sits at the foot of the Cheviot hills and is just 4 miles from the best beaches on the Northumberland Heritage Coastline. You can walk to the famous Alnwick Castle, which is the setting for Harry Potter’s ‘Hogwarts School of Witchcraft and Wizardry’ and equally famous Alnwick Garden and Treehouse, with its magnificent cascading fountains, ‘Poison Garden’ and renowned restaurant housed in the Treehouse itself. Barter Books, one of the largest secondhand book stores in the UK is also just a short walk from the cottage and where many an afternoon can be spent browsing their fantastic range of books over a cup of tea or coffee. To find out the distance of this cottage from your own home, how long it will take to drive there and other options for alternative transport, click here: Tom’s Cottage on Googlemaps and enter your home postcode. The postcode for Tom’s Cottage is NE66 1RD. A lovely cottage. Very clean and well presented. A great deal of attention given to decoration and furniture. Ideal location for touring Northumberland. We were looking for a cottage in a central town location that offered easy transport routes to other tourist attractions. We wanted to be able to walk to restaurants, cafe’s, historic attractions and shops. Tom’s Cottage offered all these and more. It was a very clean and tidy cottage with every appliance we needed, it was just like being at home. Visit The Alnwick Garden and explore the spectacular Treehouse restaurant and fascinating poison garden. The gardens are open all year round, and Alnwick Castle is also a fantastic day out for the family (of course made more famous for its use in Harry Potter!) and is open March through til October. Take a walk around Hulne Park in Alnwick, once the hunting grounds of the Percy family and open to the public during the day. Click here to download some routes around Hulne Park, but unfortunately dogs aren’t allowed. Head up to Barter Books in Alnwick, the old Victorian train station converted into the most fabulous bookstore, about 10 minutes’ walk from the cottage. Every book you can possibly imagine is here, even some very valuable first additions on display. They have a lovely café converted from the old waiting rooms in the station if you wanted a nibble and something hot to drink. As the name suggests, you can bring old books into Barter Books and exchange them for credits so you can buy something new (or old!) to take home. Pick a good book and get settled in front of one of their many open fires. Dogs and snoozing welcome!